The Liberty Mechanical Fertilizer Lime Spreader is 10 ft long, has a tandem axle and provides Medium Capacity for a variety of Applications. The Liberty Mechanical Drive Fertilizer Spreader features a Ground Wheel Drive Conveyor and PTO or Hydraulic Driven Spinners. 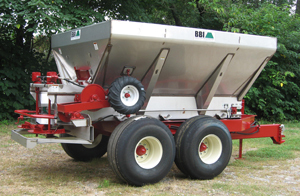 BBI ﻿Liberty Pull-Type Spreaders ﻿are designed to be the toughest, most durable fertilizer and lime spreaders in the market. With BBI's rugged design and construction you can more efficiently spread your fields, saving you time and money. UHMW and Stainless Steel reduces corrosion issues and extends the life of the spreader. UHMW Bearing Back keeps bearings clean resulting in longer bearing life and fewer failures. UHMW Comb Cover prevents streaking in the field. One-piece CNC Machined Comb gives longer chain life. Proprietary BBI Spreader system delivers a wider, flatter, more consistent pattern. Dual Rack and Pinion gate prevents jams. Overhead Spinner Motors are ABOVE the chemical, resulting in extended motor life. Want to see more spreaders? Click ﻿HERE ﻿to return to our Spreader main page. * Please note that some trailers are shown with options and specifications are subject to change without notice. If you have any questions or we can help you in any way please feel free to visit our Contact Us page. Copyright 2018 Leitchfield Truck & Trailer. All rights reserved.